The first two tenants of Woodburn Station, a retail property situated in west Woodburn at the former Miles Chevrolet location at 3001 W. Newberg Highway, are opening. Chipotle Mexican Grill, a national chain headquartered in Denver, has joined Starbucks in the nearly 30,000-square-foot retail space. 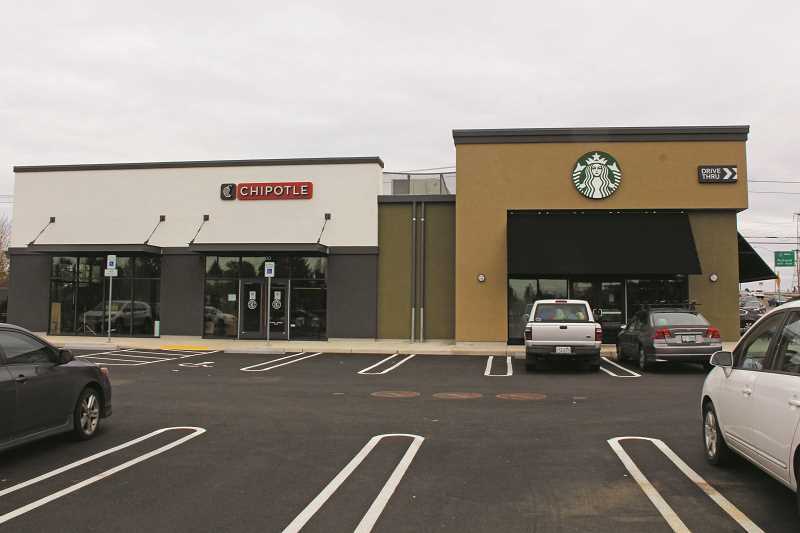 A Chipotle press release revealed that May 4 would be the opening date, and Starbucks opened its doors last Thursday. The Starbucks is replacing the restaurant's location across the street, which has now closed. Nancy's Burgers and Fries, the only other confirmed company for the site, is expected to open by the end of the summer. Woodburn Station is being developed by Master Capital Management, based in Eugene. According to site plans, there will be four buildings with drive-through lanes located at each corner of the site, with a larger retail building (which accounts for a little more than half of the development's total square footage) dominating the west end of the property along Woodland Avenue. The development has access on both Arney Road and Robin Avenue. According to the city of Woodburn, the developer has others interested in the site, but nothing has been finalized.